It’s not every day a zebra takes school assembly. But that’s what happened at Robert Le Kyng Primary School in Swindon on Thursday, as motor dealer Pebley Beach played a big part in keeping 420 children safer on the town’s roads. The Bridgemead-based Suzuki and Hyundai dealership has donated high-visibility jackets to each of the children at the school, helping them to stay safe and be seen on dark winter days. 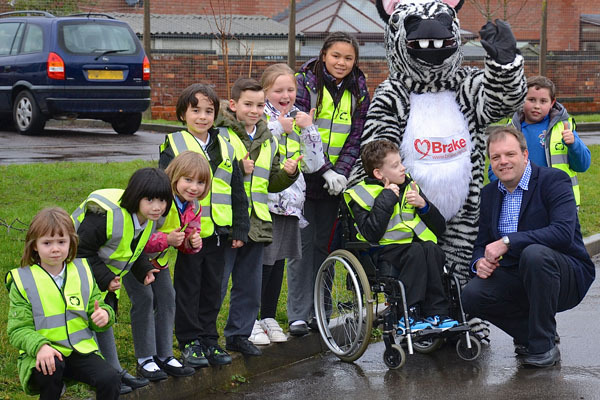 And Zac the Zebra – the mascot of national road safety charity Brake – was on hand to help Pebley Beach deliver some important road safety advice to the children. There was also advice for parents from Pebley Beach on keeping their cars in tip-top condition to help them cope with dangerous winter driving conditions. And next Friday (February 14) the children will be wearing bright clothes to school during a sponsored non-uniform day. Proceeds from the day will help Brake deliver its road safety message to other school children. “Suzuki’s national campaign in which Pebley took part, donated £5 to Brake for every winter car check,” said Pebley owner, Dominic Threlfall. Rich Andrew, spokesperson at Brake, said: “The money donated by Robert Le Kyng Primary School and Pebley Beach will be crucial in funding our work supporting people bereaved or injured by road crashes, and campaigning for safer roads in communities across the UK”. Dave Barnett, assistant head teacher at Robert Le Kyng Primary School, said: “We were delighted to run a Bright Day for Brake to support a worthwhile charity. We also saw it as a great opportunity to tell our children about our school’s particular issues – the importance of using the lollypop man, being careful when using mobile phones on the road, and not walking through the school car park! NEVER TRUST TRAFFIC. Watch what drivers are doing. They may not see you. Seven years old or younger? Hold hands when you walk along the road. Are you eight or older? Make sure your mum, dad or carer know where you are walking. STOP. THINK. LOOK. LISTEN. If it is safe, you can cross the road. Cross at crossings. Cross at a place you can see the traffic. Don’t cross between parked cars. Just because your friends cross the road, does not mean it’s safe. Check for yourself. And wear your Pebley Beach visi vest. TYRES – if they are not the right tyre for your car, correctly inflated or have at least 3mm depth of tread you will have trouble keeping control of your car when you brake or turn corners (it also costs more in fuel). BRAKES – low brakes might stop your car in normal driving, but in an emergency – like a child running out in front of you – they won’t stop quickly enough. And if you let your brakes run too low, you will have to replace pads and discs – which is double the price of just replacing pads. LIGHTS AND INDICATORS – not only do they allow you to see at night and in low light they help children who are walking (and other drivers) see you, and know what you will do. And broken bulbs and mis-aligned headlights are usually cheap and quick to replace or fix. Check them every day. CLEAN LIGHTS and INSIDE WINDOWS – dirty inside windscreens can cause glare and distract you. Dirty lights can be as bad as broken lights. BATTERY – the most common cause of winter breakdowns. If it’s older than five years, it may fail – probably when you need your car the most. WINDSCREEN – replace worn wipers and keep topped up with screen wash. Being able to see is one of the most important things you can do. Never drive with an ice or snow covered windscreen, no matter how late you are. ANTIFREEZE – without the right amount of coolant, your car will break down. Better safe than sorry – get a winter car check at Pebley Beach.